1. Dinoshark - Glaciers are a popular source of prehistoric monsters. In this movie, a glacier melts and releases a baby prehistoric shark. The dinoshark swims off and terrorizes a port in Mexico. Eating cavemen just made this shark more dangerous. 2. Megashark vs Giant Octopus - Melting glaciers free two prehistoric creatures, a giant shark and a giant octopus. The two creatures terrorize the California coast while scientists try to bring them together, hoping they'll kill each other. 3. Shark Man - - A group from a pharmaceutical company go to a mad scientist's island to investigate his research. They discover his experiments to save his son from cancer have turned him into a shark-man instead. This movie's original title was Hammerhead: Shark Frenzy, but I guess they thought it was too subtle. 4. 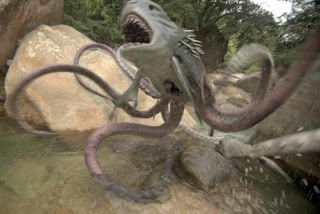 Sharktopus - When a military experiment escapes in Mexico, the scientist who created it is sent to stop it. The experiment? A half-shark/half-octopus monster! As if a man-eating shark wasn't enough, now you've got eight slimy arms to deal with. 5. 2 Headed Shark Attack - When a cruise ship sinks and strands the survivors, they discover they have bigger problems: a mutant shark with two heads. If one head doesn't get you, the other one will. Which shark movie would you see? Any crazier shark movies you know of? What would be an even crazier shark movie? Let us know in the comments! A shark with two heads is better than the alternative. Maybe next they can have Zombie Alien Cyber Sharktopus Apocalypse! I have a huge list of shark disaster films they could do. I sat through one and a half of those. 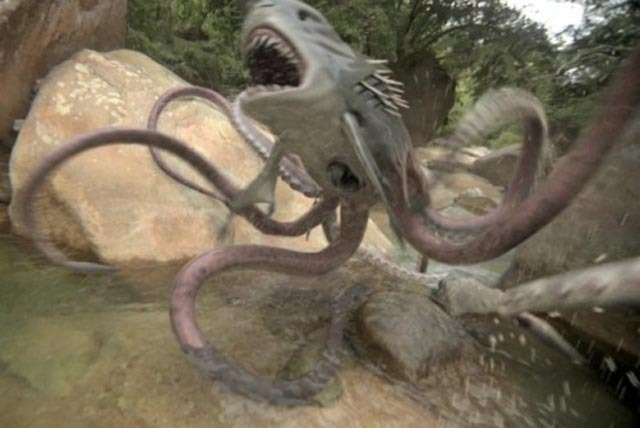 At least Sharktopus made for good MST3K fodder. sadly i loved the ones that i did see, i even bought one on dvd... okay it was used and it was a dollar. I love those kinds of movies, too, Jeremy.